Quickly steam milk for your smooth and creamy lattes and cappuccinos with this Choice 12 oz. 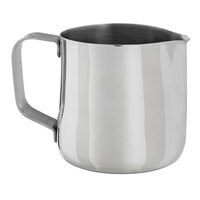 stainless steel frothing pitcher! When using with your cappuccino or espresso machine, partially submerge the steam wand into this pitcher filled with cold milk to create your microfoam. Then fully submerge the wand once the foam is added to finish bringing the milk up to its desired serving temperature. The created foam will be perfect for finishing off a variety of delicious and profitable hot beverages! Plus, the angled handle promotes an easy grip for complete control during use while the smooth-rimmed spout promotes accurate, precise pouring. This frothing pitcher is also great for training baristas to create latte art atop your beverages to increase their perceived value; by simply moving the pitcher in various motions while pouring the foam, you can create a multitude of designs like hearts, leaves, or flowers. Purchases this frothing pitcher for our coffee shop. For this price, you cannot beat this product. It lightweight yet sturdy at the same time. I would recommend to anyone. Does exactly what it says. Works to steam milk in for coffee or we use it to heat up vanilla and chocolate icing on a stove top. The spout makes pouring the warm icing out very easy. This Choice 12oz frothing jar is a bargain. I have a Breville jar that cost and it's essentially the same thing. This jar actually is wider so its easier to froth the milk without spilling. Small frothing pitcher with sturdy handle that will last for many years to come. Although it is too small to prepare multiple drinks with, it is perfect to keep on the counter for smaller orders as it takes up very little space. The frothing pitcher is fine, I just wish it would show measurements on the inside of the frother to use for multiple size drinks instead of measuring then pouring into the frothing pitcher. Every coffee shop, bar and restaurant with an espresso machine needs a frothing pitcher or 2, and this item from webstaurant is the perfect product for the job, and it comes at the perfect price. Small size but perfect for short drinks that need forth milk, really great mirror finish on the outside and keeps it even if you use it a lot!! These pitchers are a great size. We use them to give customers extra drink flavors on the side. They look sleek and do the job. Stainless steel frothing picture. We use this to prepare milk for our 10 ounce lattes, cappuccinos and hot chocolate. Very easy to clean up when done. I am a returning customer for this product. Overall it is a great frothing pitcher, it is well built and more importantly it is price right. Ideal for lattes and cappuccinos. This one was kind of small for my needs but overall a good frothing pitcher. I just needed a size up instead. This is better for making 8oz drinks. Great pitcher which we use at our coffee and tea shop for steaming milk. Very tough also as it has not dented at all even after a few falls on the ground! An essential to any barista station. The frothing pitcher is well made and has a wide top to allow as much swirling of the milk to create the best milk foam possible. The stainless steel is extremely easy to clean and a quick turn around in terms of cleaning. Well made. we bought these for our espresso in our dept. they are a lot smaller than we anticipated, so we adopted another use for them, good for a few people coffee creamer. Perfect size frothing pitcher for smaller drinks like a Machiatto or cappuccino. The small 12 oz size makes it easy to use with less waste. Mostly there`s nothing bad for this pitcher, but only the handle is not easy to hold. As the pitcher itself is heavy, and the handle is thin, better to put one finger under the handle or there would be too much pressure on hand. Stainless steel frothing picture. We use this to prepare milk for our 16 ounce lattes and cappuccinos. Works as it shoukd and easy to clean. Most utensils I buy on here I buy one in each size to test out and always return for a couple more in each size, these are perfect for my needs. These pitchers are great for size serving milk frothing. They feel sturdy yet lightweight and heats up quicker. The handle stays cooler to the touch but the gap between the handle and the pitcher is hard for big hands to not touch the surface. This is good for at home use. I wouldn't recommend this size for a coffee shop though as it is very small. But for at home use it is great! I've had the same pitcher for 2 years and after a simple clean it's still shiny and brand new looking. These frothing pitchers are built to last! I have both the 12oz and 20oz, the 12oz is a little small for my needs but its still a great well built and clean up nice! Great for authentic cappuccinos. This one isn't very large, but it's a perfect size for about 90 ml of milk, frothed to perfection. Well constructed, durable, and it can easily be cleaned in the dishwasher. Good size frothing pitcher. Light and durable. It is well made, high standard stainless steal, which makes it easy to wash and maintain. Webstaurantstore.com offers these at a great price. This 12 oz frothing pitcher is your basic pitcher, nothing too fancy. It's durable and heats up milk well, we use it with our cappuccino machine daily and have even used them to serve cold milk/cream with peoples coffee. 12 oz. Frothing Pitcher - perfect tiny pitcher. I will order larger size next time due to the quantity that gets frothed at my place at one time. This is a basic pitcher that works well and is a good value as it's appropriately priced. Product weight is good, I have no issues with it and will purchase additional units soon. Basic 12 oz frothing pitcher. Works great for our espresso machine. It cleans very nicely and comes at a great price compared to retailers and many coffee shop wholesalers. We love this little 12 oz Frothing Pitcher! We use it for many different things but oddly enough not for frothing! The stainless steel cleans up very well. Good size frothing pitcher. Metal is not too thin, so no worry of denting. Handle is sized well; very convenient to hold. Spout is good size for slow pour, but not a good idea to try and pour fast. Very impressed. Nice product for the price. Not cheap, thin, flimsy. Quality for a reasonable price. I don't froth, but I just keep coming up with more and more uses for this versatile lil pitcher. I'm sold. It can be difficult to steam small amounts of milk for a cappuccino or macchiato in a larger pitcher. This smaller size helps up reduce waste. This is a standard frothing pitcher that works just as we expected. The stainless steel is a sleek look that works great in our cafe. I really love this little frothing mug. Any bigger and it would not fit under my machine. It is the perfect size for my 12 oz cappuccino I make. I use my milk frothing pitcher on a daily basis. Since milk gets really hot, accidentally touching the sides can really hurt you. the handle helps prevent this as it is easy to hold. this pitcher is also really easy to clean so thats a bonus. It's a small frothing pitcher. I do not recommend it for a larger coffee drinks. But for a small amount of work, it's okay I guess. It's pretty short and looks tiny. However, the overall quality is really good. The handle is sturdy and has a clean finish. Perfect small frothing cup, good for smaller drinks like real cappuccinos and cafe macchiatos. Sturdy and pretty shiny. Does what it needs to and whats expect of it. Nice and thick frothing cup for our espresso machine. This is the small size that may take some practice to master for beginners. If you are new you may want to consider 33oz. Perfect size for a single drink this pitcher is small but feels very sturdy and has a decent weight to it. Seems like it'll hold up for a while. the 12 oz.frothing cup is so durable and very shine .i am looking for it in every where for so long . very high quality and great price.i will by the other sizes too.i love it.THANKS WEB. We offer coffee cocktails at our bar -- this is the perfect frothing cup for our espresso service. Would order again: easy to clean, price is right, looks good. This is a perfect size to either do two 12 ounce coffees or 1- 20 ounce perfect. Cleans up very well too, nice and shiny. Love my little 12 oz frothing cup! It's perfect when you need to do such a small amount that the steam wand won't really reach the liquid without making soap bubbles. Cleans great - out of stainless. Nice investment. Perfect sized cup for two+ shots of espresso. Ours has been dropped, scrubbed and bumped and it still is together. Cleans and sterilizes very well and looks like new after two years. Its not all scratched and foggy. Durable. An attractive sturdy cup at a great price. Might be a little small for frothing milk for larger cappuccino sizes, but we also use it as a receptacle for espresso. This is a perfect size, solid, frothing cup, its just right amount for a nice cappuccino and the spout is perfect as its drip free due to the protruding edge. You cannot have a Barista Bar without a frothing cup. We use it daily! It cleans well! All stainless steel cleans well. When frothing, the thermostat fits perfectly without getting in the way, and depth of the cup help keep the frothing wand out of the way. What a sweet looking thing. It is well-made, the finish is great and the size is perfect for home use. Totally affordable. Don't even have to use it for coffee; a cup of hot frothing milk lifts your spirits on a gloomy winter day. Also great for transferring liquids to narrow necked bottles. This is actually high quality and a great price. Perfect for our espresso machine. In fact, we actually just bought another one as we like it so much.